I got the chance to try out this eye gel in exchange for my honest opinion. This company is very new to me, and with most new things i am hesitant. The first thing i checked before reviewing was the ingredients. I had the chance to review another eye cream you can read about that HERE. I added straight from their amazon listing, the information. I love that it is mainly all natural products. Having a insomnia problem adds to negative things like bags under eyes. When i applied this the first time it made the eye area so smooth. i honestly thought the product was not going to work. When i woke up on day 10 of using it my bags were hard to find. This is a great product in my opinion. its fairly priced on amazon. The product worked for me perfectly and i am very happy with the results. ★LUXURIOUS FEEL - It contains Plant Stem Cells and Matrixyl 3000 and Hyaluronic Acid for Superior Anti Aging Effects which hydrate the flimsy eye area (including eye lids) to avoid premature ageing.The Eye Gel (Not Eye Cream) is specifically has an advanced formula for the delicate skin around your eyes to reverse the signs of aging. Is soft and feels soothing when you put it on. In fact, some have described the feeling as luxurious. It is not greasy. Formulated for Quick Absorption. ★DARK CIRCLES AND PUFFINESS? Are you troubled by dark circles and puffiness under your eyes? Do people think you party too much or don't get enough sleep, even though the real problems are your family genes or broken capillaries under the eyes? If you are still looking to find real, effective anti-aging treatment for the eye area then look no further. 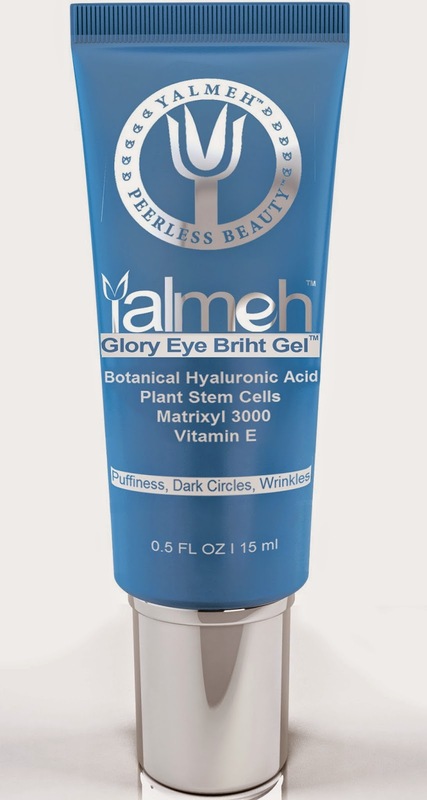 Yalmeh Glory Eye Bright Gel (Not Eye Cream) Dramatically reduce the appearance of Dark circles, Puffiness, Dryness and Sagging around the eyes and Increases softness, firms and plumps the skin around the eyes.People also use it around the mouth, forehead and cheek area and have seen similar results in those areas. ★ SAFE, ALL NATURAL INGREDIENTS- Yalmeh Glory Eye Bright Gel contains all natural ingredients, no toxic chemicals or cancer causing additives - no mineral oil, sulfates or alcohol ,propylene glycol or paraben. We do not test our products on animals NEVER-EVER. This is the BEST EYE GEL and is an effective natural solution for all types of skin. And, it lasts forever - a little goes a long way. And what matters most, however, is that the Yalmeh Glory Eye Gel works incredibly well. You will feel better both inside and out. THIS EYE GEL is 100% natural & 75% organic. ★REDUCE FINE LINES - Watch the fine lines in the corners of your eyes be reduced to the point that they are no longer visible. With Yalmeh Glory Eye Bright Gel, you will see the difference in the morning. Your skin will look younger, feel softer and the areas under your eyes will look lighter. People who have used it around their mouth, forehead and cheek areas, have seen similar results in those areas. Our products are Made in the U.S.A. in our Advanced FDA Registered Facility. Everyone that uses our products, come back for more. We must be doing something right!